BF1 simulator is ready (it will have some minor changes in hitbox legs that do not affect these results). It has some refinements respect to BF4 and more parameters are recorded. 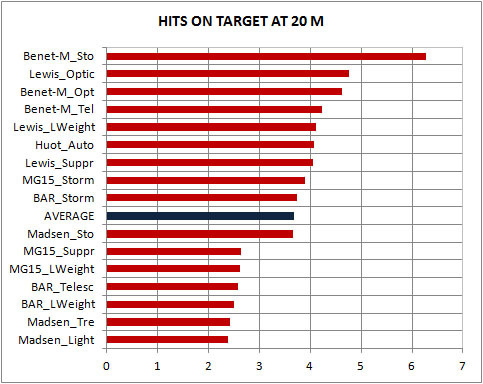 It supports changes in definition of hitbox, works with selectable number of bullets in the burst between 1 and 10 and especially the statistical valuesÂof the clouds of hits are recorded . Obviously new values of multipliers and many other things. Today, 2000 bursts of 10 rounds per weapon, perfect aiming ADS to intuitive center mass of torso (between shoulders and crotch) without recoil correction. Remember that this is a test in test bench in standard conditions. (Surely your aiming is not perfect and you can control the recoil up to some degree). Without too many comments. As there are many lines in some graphics a cut at 20 meters sorted from highest to lowest value it is presented. 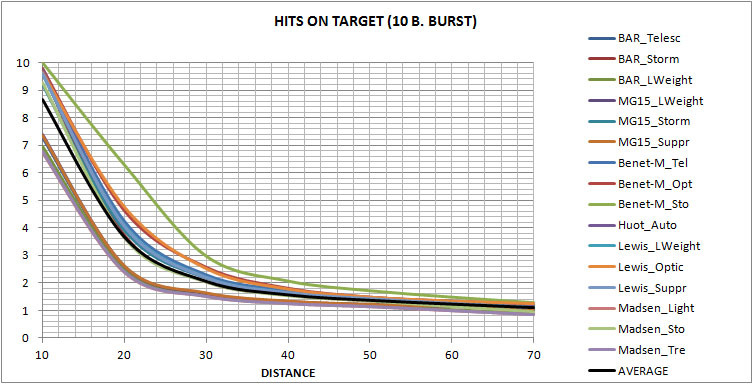 Hits on target (without damage and multipliers). Plain accuracy. Time to Kill at 10 and 20 m (remember that this is effective TTK considering missed bullets and the time of the first bullet to arrive. No TimeToADS is considered). 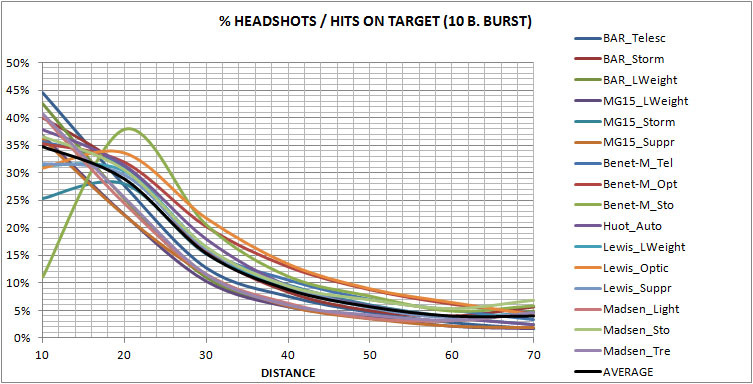 And % of headshots on the total number of impacts. Has it changed much about BF4? 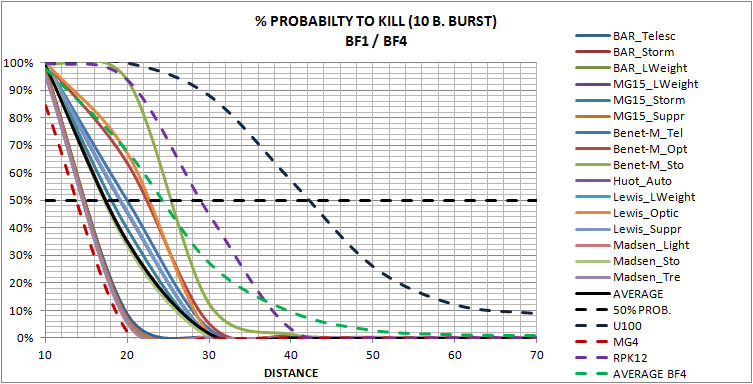 Here the results of the BF1-LMGs probability of DMG> 100 with the BF4 extreme and average values (RPK12 is also shown because U-100 had extreme accuracy values). And seen otherwise, BF1 extreme and average values on the BF4 values. 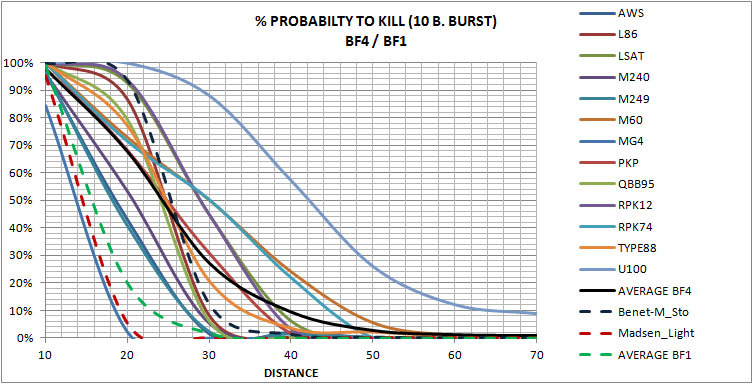 1 Conclusion: the design (negative spreadinc and other parameters) narrows the range of useful distances. 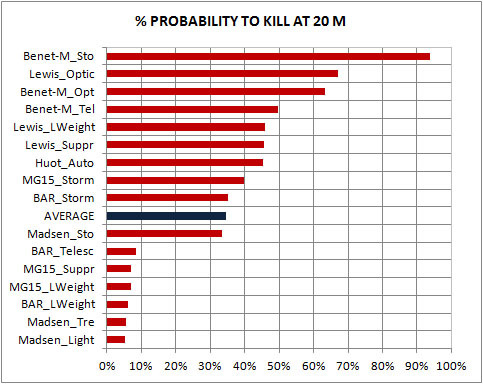 50% of chance of killing occurs closer than 25 m in most LMGs . 2 Conclusion: There is much less variety of behaviors that in BF4. Oh I haven't been working on that since the last image. I haven't checked this, but I guess the hitboxes in those files are in "T-pose". While legs wouldn't be a problem, I still believe hands in front of chest should be accounted somehow. I might do rest of the hitboxes next week, but that's a big if. In any case, it doesnÂ´t affect if you aim to chest. And that is a bench test, against a synthetic target. But if the synthetic target is like the hitbox in game...it is better. it's clear that these lmgs are underpowered against single targets compared to bf4, no doubt about that, but what about bf1? and if they have an issue, what would you do to fix them? better min spread? lower fssm? 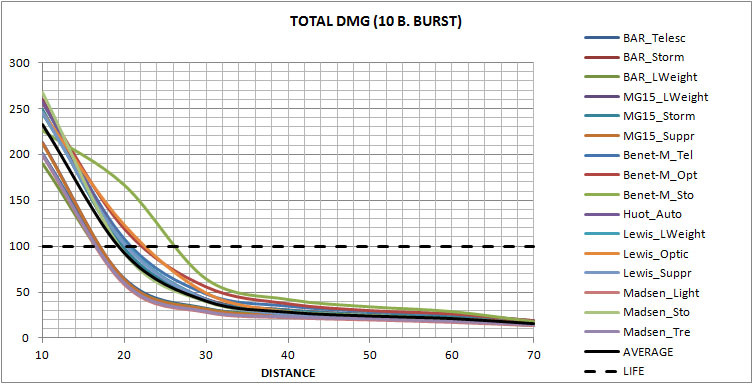 better damage model? the work you're doing is great in any case. I still do not see how the Benet-Merci should be experiencing a spike in hits while all the other LMGs are slowly losing their ability to land damage. Can you explain that better? The "explanation" chart you linked doesn't really make its weird performance any clearer. we are in an intermediate point between the Synthesis of Information and the Analysis. It is intermediate because some Information is self explanatory. 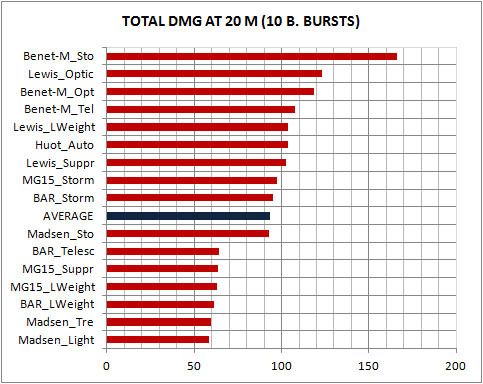 The reason for the results of Benet-M Storm is the weapon is "too much" accurate. 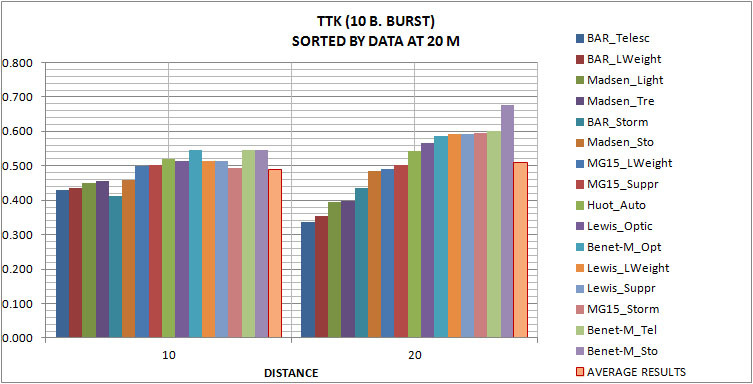 Here you have the BM STORM bursts scatter plots at 10 and 20 m.
At 10 m it places almost 10 bullets (9.99) on target mostly in the chest. Why?. Because it has a very low recoil. 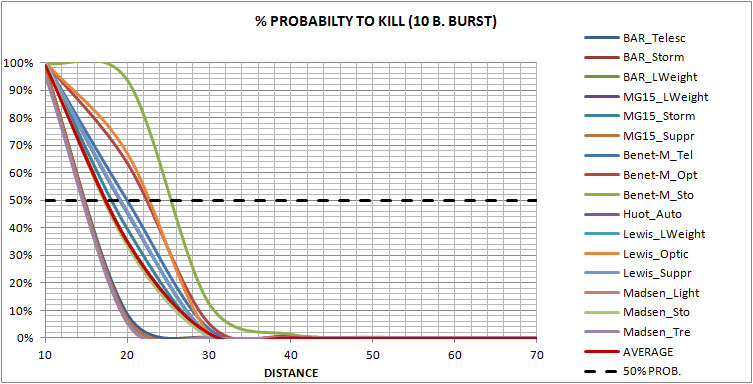 Therefore produces few headshot (11% when the average value of all weapons is 35%) and total damage is low. 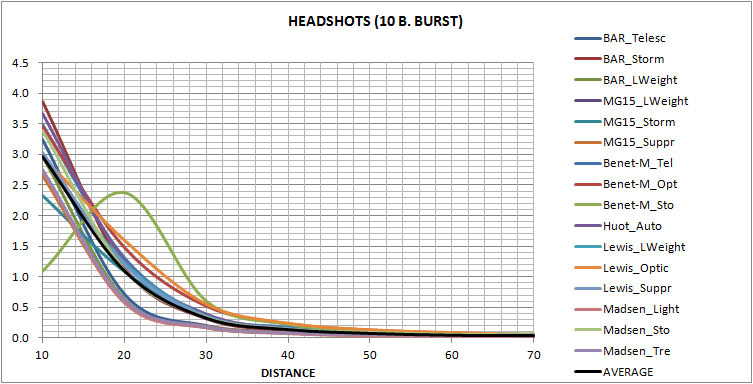 At 20 m (6.28 hits, 39.7% headshots) there are many more headshots and total damage is much greater, but in the 5.98 bullets burst that you need to kill, probably 4 or 5 remain chst shots.The price you pay for all this is a high TTK at 20 m. All graph have to be understood together. That in BF4 was typical of the bipoded weapons. 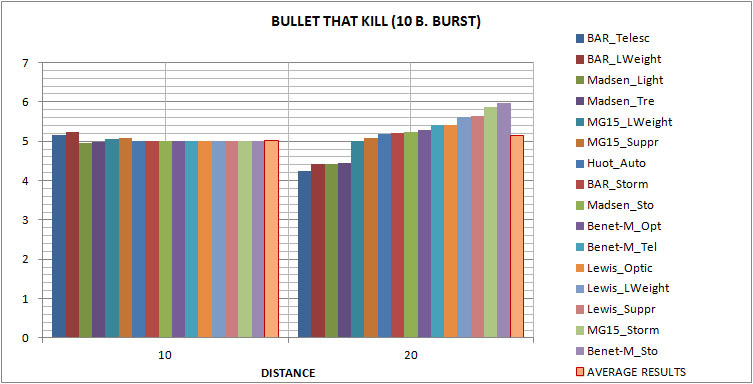 Obviously if the burst was 20 bullet or more the damage curve would be as represented here with red line. It has that singular shape because the number of bullets is limited. At 10 m it can land 14 or more bullets on target... and from 10th to 14th-> headshots. A curve as the green line (even closer) would be more logical to maintain proper gradation of weapons and avoid too singular behavior. Here are the parameters of weapons related to average value of all LMGs (1 = average, 2= twice the average value....). BM STORM is red line. Average value is the black line. You can see the parameters that are extremely different = horizontal and vertical Recoil. Those are to be changed... if you don't want those kind of weapons. Or not, because maybe you like Idiosyncratic weapons. but it also means that it is not op, rather... so easy to use that it can use itself without being the most effective if used properly? to be honest it's way too complex for me. Use thinner lines in your excel Diagrams. Unfortunately in EXCEL lines in the legend have the same thickness as the lines on the graph. 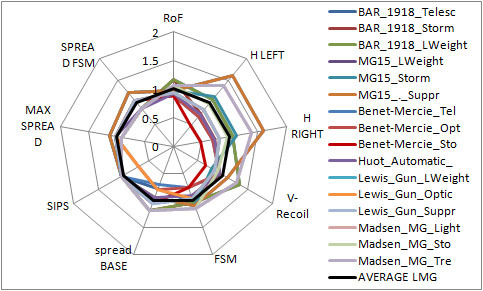 If thin lines are used in the graph, legend is illegible, especially with so many weapons. Problems when they become images are also important because you can lose thin lines. If you are interested in distinguishing lines in some graphic let me know and I can produce it. In any case the object of these graphs is to see the general appearance, not distinguish between weapons, which otherwise are quite similar. For the distinction are better other kind of graphs such bar graphs (cut at 20 m shown). I can not say it's OP because that depends on the results in game and that on the style of play. If you use it as an assault weapon in CQB you will get very bad result. Assault weapon need more recoil and spread to get headshots quickly. Remember that the maximun efficiency of a weapon in the RECOIL-SPREAD space is not in the minimum recoil or spread. In BF1 it was approximately in the average weapon.parameters. in any case we can say that Benet-M Storm is "over accurate". - Very narrow range of use (all indications say that DICE wants to "squeeze" the game). - A boring variety of behaviors (perhaps for that strange technique of fixed weapon variants, surely for not to have enough real weapons of that time). My opinion (provisional) is this technique fails. The distinction between Light Weight, Storm, Trench, Optical, etc.... is very artificial because it forces to maintain ROF, damage and many other parameters and at the end weapons have very similar results. That is why ARE5R06 complains about thickness of the lines. In BF1 nobody complained about that. - In general more dificult to use than in BF1 (but that may be consistent with the fact that weapons were rudimentary compared to today: dificult reload, small magazines, not many gadgets, etc...). And this is just in standing ADS use..... we will see moving or hipfiring. You should account for rpm too as it's the ttk that's important.